“The Newest Americans,” a photography exhibit that explores citizenship and immigration in the Trump era, opens Monday, October 15, in the Daura Gallery at University of Lynchburg. The exhibit will be on display through December 10. Admission is free and the public is invited. The traveling exhibit, by photographer Sam Comen and reporter Michael Estrin, captures the experiences of immigrants, prompting discussion on America’s legacy as a nation of immigrants and the future of the American dream. 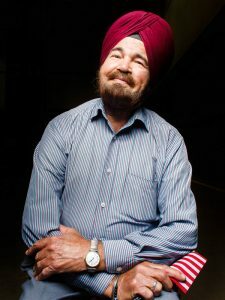 Darshan Singh, an immigrant from India. Photo courtesy of photographer Sam Comen. “We wanted to explore the definition of ‘American’ and who has the right to become one in the aftermath of the 2016 presidential election,” Comen said. “We wanted to document the stories of new Americans, to know why they came to this country, and what the American Dream means to them. Illustrating a wide range of ages and walks of life, the 29 exhibit participants represent 23 countries of origin, including Mexico, Rwanda, China, Russia, and Syria. The exhibit includes photographs accompanied by text panels presented in English and Spanish, sharing the subjects’ views on why they chose to become American citizens and what the American dream means to them. The exhibit is one of many initiatives the University of Lynchburg has planned over the next year in conjunction with American Evolution, Virginia to America, 1619 to 2019, a series of events, legacy projects, and initiatives that celebrate the 400-year history of the Commonwealth of Virginia. Lynchburg is a higher education partner of the commemoration.